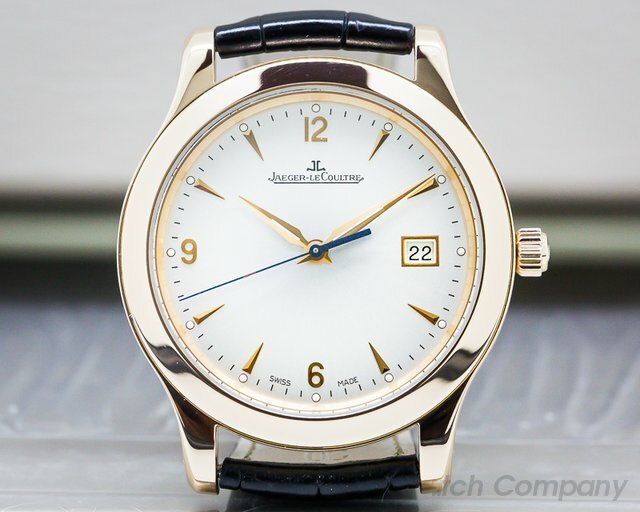 Below is our current in stock inventory of Jaeger-LeCoultre watches. 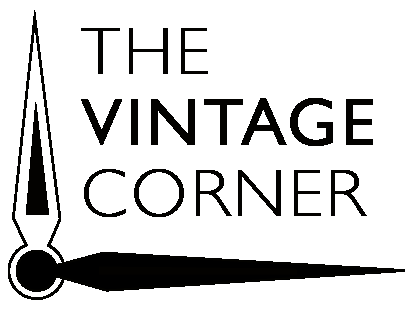 If you have a Jaeger LeCoultre you are interested in selling or trading please contact us. 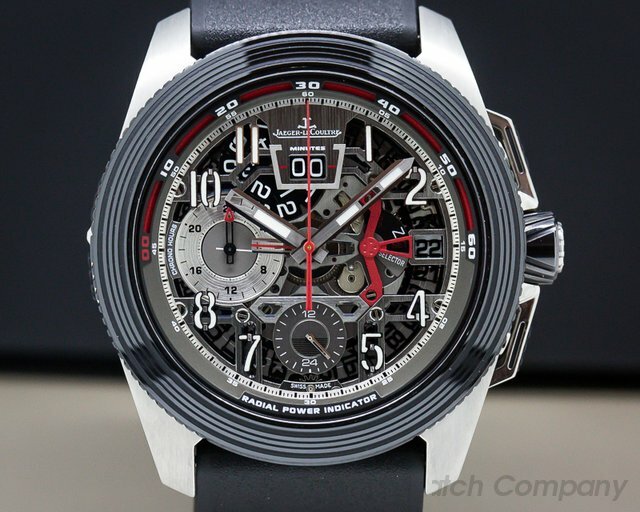 31301 Jaeger LeCoultre Q203T540 Master Compressor Extreme Lab 2, Limited edition of 300 pieces, Automatic JLC 780, Power Reserve 60 Hours, Titanium Case on a Rubber Strap, Ruthenium Dial with Luminous Hands and Arabic Numerals, Skeleton Dial, GMT, Chronograph, Functions Changed Through Pushing the Crown, Sapphire Crystal, Fixed Titanium Bezel, Date at 3 O'Clock, Size: 46.8mm, Thickness: 16.5mm, Like New with original box and papers dated April 2013. $47,100 MSRP. 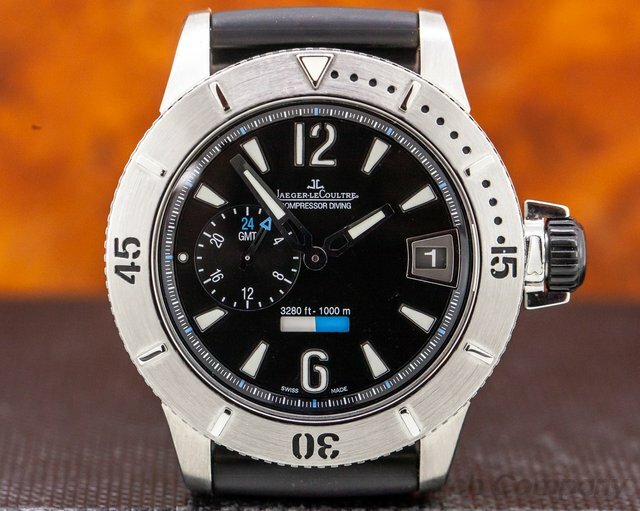 31132 Jaeger-LeCoultre Q160T05 Master Compressor Diving GMT 160.T.05, Limited Edition to 1500 Pieces, Titanium Case on a leather strap, Automatic Movement, Black Dial with Luminescent Hands and Stick Markers, Hours, Minutes, Reference Time (at 9), Date, Movement Operating Indicator, Unidirectional Rotating Bezel with 60 Minute Diving Scale, Calibre: Jaeger LeCoultre 975D, 29 Jewels, 48 Hours Power Reserve, Diameter: 44mm, Thicknes: 15.5mm, Sapphire Crystal, Screw-Down Crown with Patented Locking Mechanism, Water Resistant to 1000 Meters, like new with box and papers. This watch was just completely serviced. 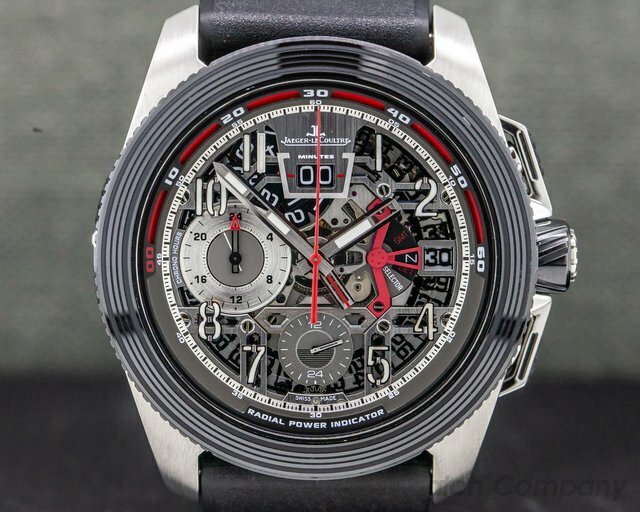 31192 Jaeger LeCoultre Q203T540 Master Compressor Extreme Lab 2, Limited edition of 300 pieces, Automatic JLC 780, Power Reserve 60 Hours, Titanium Case on a Rubber Strap, Ruthenium Dial with Luminous Hands and Arabic Numerals, Skeleton Dial, GMT, Chronograph, Functions Changed Through Pushing the Crown, Sapphire Crystal, Fixed Titanium Bezel, Date at 3 O'Clock, Size: 46.8mm, Thickness: 16.5mm, Like New with original box, additional rubber strap, and papers that are stamped but undated. $47,100 MSRP. 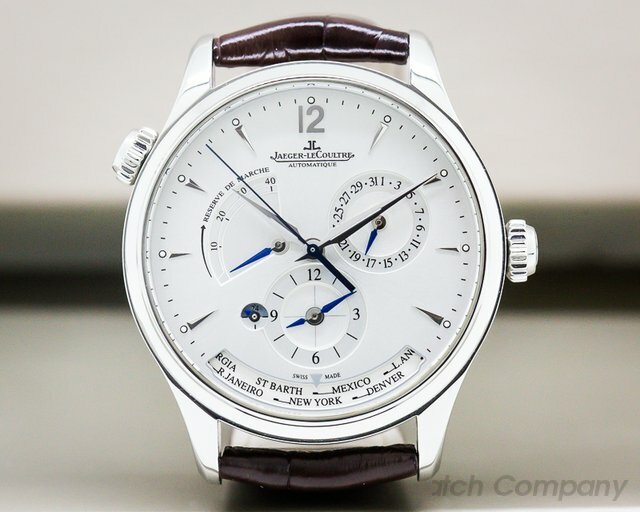 31180 Jaeger LeCoultre Q1428421 Master Geographic, 142.84.21, 1428421, stainless steel on a strap with a stainless steel deployant buckle, automatic Caliber 939, date, 43-hour power reserve indicator, second time zone, night and day indicator, water resistant to 50 meters, sapphire crystal, diameter: 39mm, thickness: 12mm, like new with original box and papers dated 10/2014. 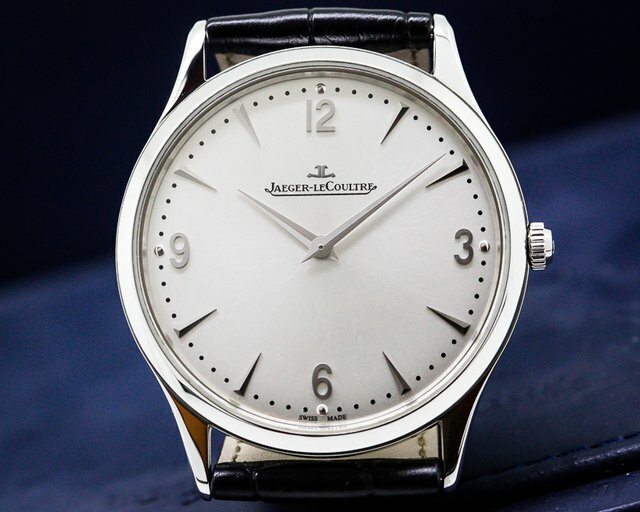 30950 Jaeger-LeCoultre, Master Ultra Thin, 172.8.79.S stainless steel on a strap with a stainless steel deployant buckle, manual wind Jaeger LeCoultre ultra thin caliber, silver dial with applied numerals, display back, diameter: 38mm, thickness: 6.3mm. Like New with original JLC. 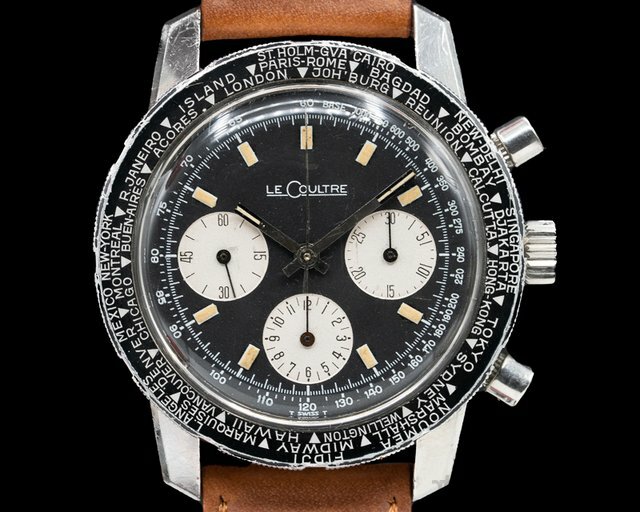 31039 Jaeger LeCoultre Vintage Shark Deep Sea E2643 Chronograph, E 2643, brushed stainless steel case on a shell cordovan strap, the case is sharp and may be unpolished, manual wind Valjoux 72 movement, three register chronograph, black dial with silver subdials, luminous hands and markers with matching patina, external rotating tachymeter bezel (also comes with world time bezel), original dial and hands, dial is marked "LeCoultre" indicating it was sold to the US market, acrylic crystal, circa 1970, diameter: 40mm, thickness: 15mm, Very Rare and in Excellent Condition with original box and certificate which are not filled out. 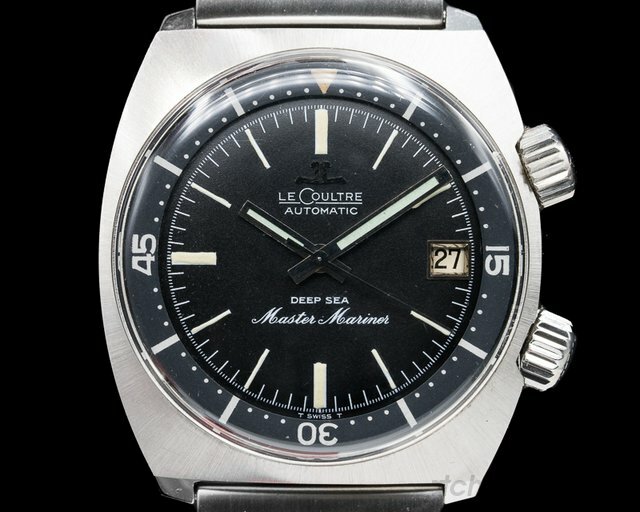 29715 LeCoultre E 558 Barracuda Master Mariner Deep Sea, E558, stainless steel case on the original stainless steel bracelet, automatic LeCoultre Calibre K883, rotating 60 minute inner bezel, date at 3 o'clock, acrylic crystal, "LeCoultre" signature indicates an American market watch, crosshatch crowns, original luminous hands, center-sweep seconds hand, size: 36.5mm x 40mm (including lugs), thickness: 14mm. Excellent Condition with European Watch Company pouch and 6-month warranty. 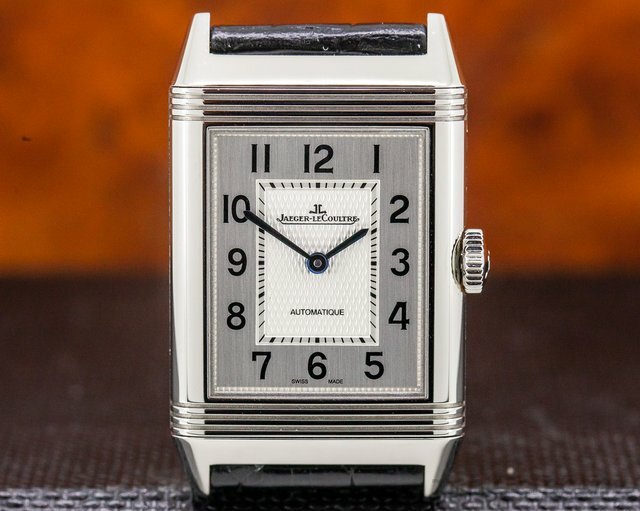 31036 Jaeger-LeCoultre Q1392420 Master Control 139.24.20, 18k Rose Gold on a Strap with a 18k Rose Gold Deployant Buckle, Automatic Movement, Date, Centered Sweep Seconds Hand, Sapphire Crystal, Silver Dial with 18k Rose Gold Applied Numerals, Diameter: 40mm, Thickness: 8.5mm, Display Back, Water Resistant to 5 atm, Like New with Jaeger box and stamped blank date warranty card. 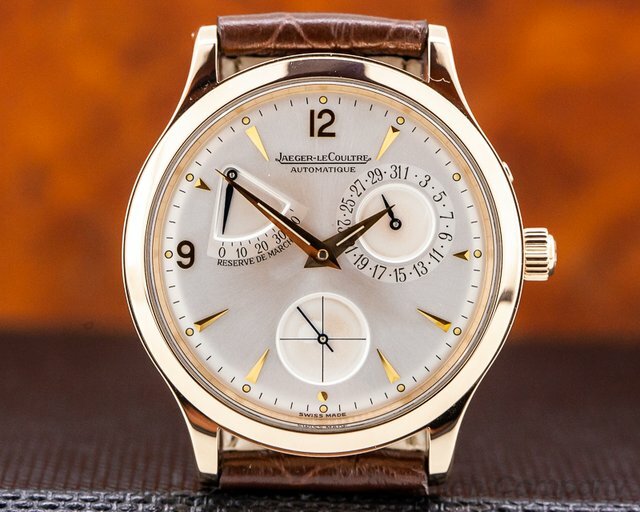 30778 Jager LeCoultre Q1482401 Master Reserve de Marche 148.24.01 1482401 18k Rose Gold on a rose gold buckle, automatic movement, power reserve indicator at 9 o'clock, rose gold applied hour markers and Arabic numerals, pointer date at 3 o'clock, water resistant to 100ft, diameter: 37mm, thickness: 10mm, Like New with Box and Papers; dated April 1991. 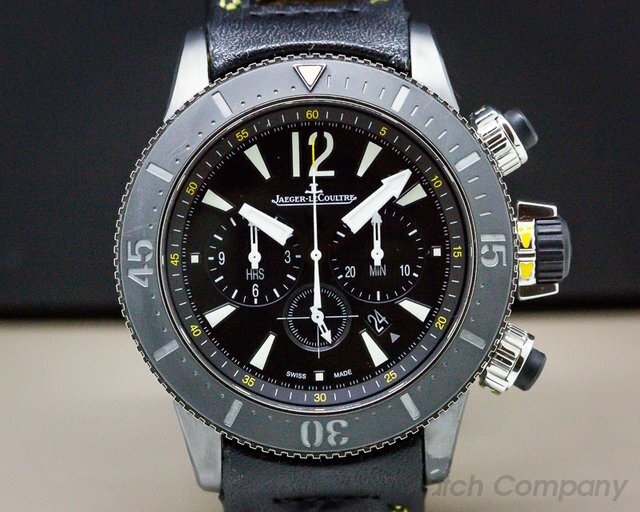 30605 Jaeger LeCoultre Q178T471 Master Compressor Diving GMT Navy Seals, 178.T4.71, 178T471, limited edition to 500 pieces, titanium case on a leather strap with a stainless steel tang buckle, automatic movement, 65 hours power reserve black dial with luminescent hands and stick markers, sapphire crystal, screw down crown with patented locking mechanism, unidirectional rotating bezel With 60 minute diving Scale, water proof to 300 Meters, diameter: 46.3mm, thickness: 18mm, Like New with box and papers from 10 / 2012. 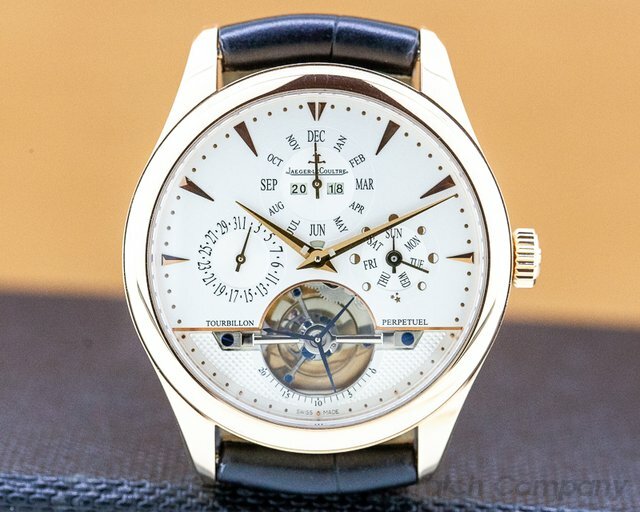 30804 Jaeger-LeCoultre Q2008470, Memovox Tribute to Polaris, Limited & Numbered Edition of 768 Pieces World-Wide, numbered 431/768. 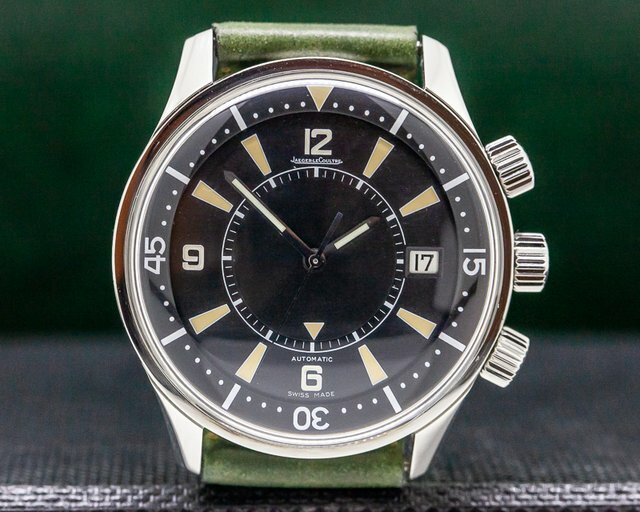 Reference: 200.84.70, Stainless Steel on a Strap with a Stainless Steel Buckle, Automatic Movement (JLC Caliber 956), Black Dial with Arabic Numerals & Index Hour Markers, Date at 3 O'Clock, Alarm, Uni-Directional Rotating Bezel, Diameter: 42mm, Thickness: 17.52mm, Power Reserve of 45 Hours, Water Resistant to 200 Meters, Like New with Original Box and Papers dated December 9,2011. 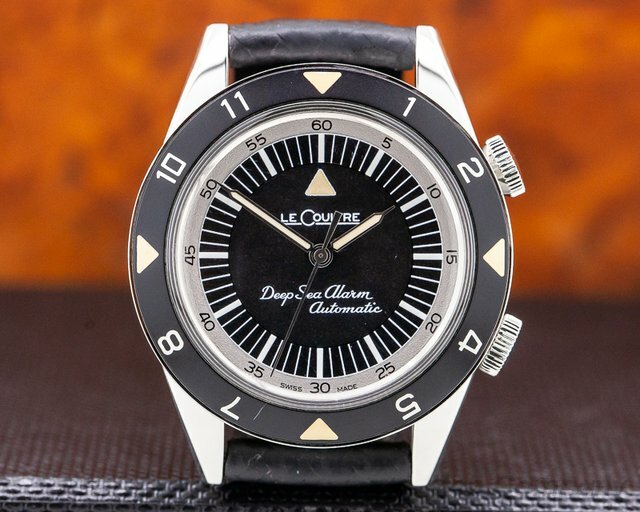 30805 Jaeger LeCoultre Q2028440 Tribute To Deep Sea, American edition, 2028440, 202.84.40, Limited Edition of 359 Pieces, A Tribute to the Original Memovox Deep Sea Watch which was Originally Presented in 1959, The First Automatic Diving Watch to Feature an Alarm Function, Stainless Steel Case on a Strap with a Stainless Steel Buckle, Automatic Movement (Jaeger LeCoultre Caliber 956), Power Reserve of 45 Hours, Black Dial with Luminescent Hands and Hour Indicators, Plexiglas Crystal, This was the Water Resistant to 10 atm, Size 40.5 mm, Thickness 14.5mm, Like New with Original Box and stamped but undated papers.